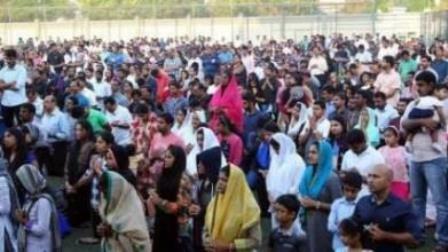 Thousands of Christians across the country are observing the Passion Week with utmost devotion and reverence. The Passion Week started with Palm Sunday on March 25. And on Maundy Thursday, churches held masses with washing of feet. On Good Friday, the day of fasting and abstinence, ceremonies at the church included Stations of the Cross, Penitential Rite, Liturgy of the World, Prayer of the Faithful, Unveiling of the Cross, Holy Communion and Veneration of the Cross. On holy Saturday, Easter Vigil will be held from the evening. And Easter Sunday will see holy mass starting from early morning. Mass timings at St Joseph's Cathedral in Abu Dhabi will start at 4am. It will be held in English, French, Arabic, Korean, Italian, Polish, Urdu, Spanish, Tamil, Konkani, Malayalam, Sinhala and Filipino languages. All the collections at St Joseph's Cathedral will be set aside for the poor, orphans and needy people of the mission. Apostolic Vicar of Southern Arabia Bishop Paul Hinder led the services at St Joseph's Cathedral. The UAE churches also had distinguished priests joining the celebrations. In Dubai, a full and overflowing crowd from early morning 4.30am until night was witnessed by most of the churches on Good Friday. Members of many Christian denominations, including the Anglican, Catholic, Eastern Orthodox, Lutheran, Methodist, Oriental Orthodox and Reformed traditions, observed Good Friday with fasting and church services. At St Mary's Catholic Church in Dubai, the footfall - at any given point of the day - touched 10,000-15,000. "The flow started from 4.30am in the morning and continued till night. One group, community attends and goes and the next batch comes in. Each service on Friday was for about two hours. Main parish priest Fr Lennie Connully, assisted by 10 other parish priests, conducted the services at the St Mary's Catholic Church," said J.James, liturgical coordinator at St Mary's Catholic Church. Proceedings at St Gregorios Orthodox Church in Sharjah was led by supreme head of the Indian Orthodox Church Baselios Marthoma Paulose II. "I am pleased to be here among the faithful. The UAE is one place where all religions live in peace and harmony. I urge all faithful to pray for the wellbeing of the UAE leadership, which has allowed all religions to prosper in the country. As this is the 'Year of Zayed', I want to make use of this opportunity to further spread the message of love among people," Paulose II, from south Indian state of Kerala, said. Thanking and lauding the leadership of the UAE, James said: "I have no words to express our gratitude to this amazing country. We are free to access and practise our faith, and the authorities here support and facilitate the celebrations of our festivals. They ensure smooth traffic flow, strong surveillance, and peaceful get togethers. Our first word of thanks goes to the ruler of Dubai and then to all the authorities of the country such as the police and emergency services." Friends Sangeeta, Roopa and Swati had come to a protestant church in Oud Maitha to attend one of the prayer services of Good Friday. "We are here to show our love and affection for Jesus and listen to some thought-provoking lectures by our priests who explained to us how we should have a good conduct and character," Sangeeta said. Meanwhile, Bijoy Francis, Abu Dhabi-based engineer working offshore, was happy to join in the celebrations at St Joseph's Cathedral. "This is an opportunity to catch up with all my friends and enjoy the festive spirit together at the church." For followers like Bijoy and others, it is a countdown to end weeks of fasting with grand feast on Easter Sunday.